Hello Friends! It is hard to believe that it is the weekend already....wasn't I just posting this review a few moments ago? Oh well, I KNOW it sounds trite, but it IS so true. Thanks so much for stopping by! I hope that you enjoy your visit and maybe some ideas will stimulate your own thinking on investments. As always please remember that I am an AMATEUR investor so PLEASE do your own investigation on all stocks discussed on this website and PLEASE consult with your professional investment advisors! If you are new around here, or if you are viewing this entry on a third-party website, you might not be familiar with my activity here. What I like to do is look at stocks each day (almost) and scan through the big gainers. I believe some of your best stock market movers will be found there! I review their latest quarterly result, their five year results as presented on Morningstar.com, some basic valuation questions, and a quick check on what their chart looks like. I had a more professional investor tell me that what I was doing was JUST due diligence. I guess if that is what it is, I am ok with it....anyhow, I post these stocks, write why I like them, and then on weekends, when I get a chance, I review past picks to see how they turned out. In addition, I share with you my actual trading portfolio. I have other investments managed by professionals....but what I call my trading portfolio is real and is what I control. That's it in a nutshell! As always, if you have any questions, comments, or words of encouragement, you are MORE than welcome to email me at bobsadviceforstocks@lycos.com . On June 16, 2003, a bit over a year ago, I posted Quest Diagnostics (DGX) at $64.28. DGX closed at $87.30 on 6/25/04 for a gain of $23.02 or 35.8%. On April 22, 2004, DGX reported 1st quarter 2004 results. Revenue grew 14.9% over prior-year levels to $1.3 billion (reflecting the acquisition of Unilab.) Net income came in at $116.1 million in 2004 vs $88.0 million in the 2003 1st quarter. On a fully diluted basis, this came in at $1.13/share vs $.88/share last year. This company is doing great! Dominion Homes (DHOM) was posted on Stock Picks on 6/16/03 at a price of $24.50. DHOM closed on 6/25/04 at $23.87 for a loss of $(.63) or (2.6)%. On June 16, 2003, I selected American Home Mortgage (AHM) for Stock Picks when it was listed on the NASDAQ with symbol AHMH at $19.49. In December, 2003, after the acquisition of Apex Mortgage it reorganized as a REIT, and as of June, 2004, has a new symbol of AHM. AHM closed on 6/25/04 at $26.20 for a gain of $6.71 or 34.4%. On April 28, 2004, AHM announced 1st quarter 2004 results. Net earnings were $21.2 million vs $16.3 million the prior year. Earnings/diluted share were $.70/share compared to $.96/share the prior year. However, dividends were $.55/share compared to $.10/share last year. On a more optimistic note, the company DID raise 2004 earnings guidance to $3.25 to $3.40/fully diluted share. I am a bit concerned about ANY drop in earnings/share...and with this such an interest-rate sensitive field, imho, I am just a bit cautious about the REITs and building stocks that were so hot last year. Whitman Education Group (WIX) was posted on Stock Picks on 6/16/03 at a price of $14.89. As was reported on July 1, 2003, Career Education Corp. completed its merger with WIX. Shareholders of WIX received $6 in cash and .138 shares of Career Education (CECO). Since CECO split 2:1 on 8/22/03, this would entitle each share of WIX to receive .276 shares of CECO. CECO closed at $44.97 on 6/25/04, this means that each share of WIX would currently be worth $6 + .276 x $44.97 or $18.41. Thus, this would represent a gain of $3.52 or 23.6%. On June 17, 2003, I posted Outback Steakhouse (OSI) on Stock Picks at $39.76. OSI closed at $42.20 on 6/25/04 for a gain of $2.44 or 6.1%. On April 20, 2004, Outback reported 1st quarter 2004 results. Net income was $48.3 million or $.62/diluted share vs. $42.6 million or $.54/diluted share the prior year. Revenues for the quarter increased 25.3% to $816.6 million from $651.7 million the prior year. Overall, the company appears to be doing satisfactorily. FactSet Research Systems (FDS) was posted on this website on 6/17/03 at a price of $40.39. FDS closed at $47.00 on 6/25/04 for a gain of $6.61 or 16.4%. On June 15, 2004, FDS reported 3rd quarter 2004 results. Revenue for the quarter jumped 11.9% to $63.6 million from $56.8 million last year. Earnings were up 2.9% to $14.7 million, or $.45/share from $14.3 million, or $.41/share in 2003. These results are o.k. Not enough maybe for me to sell these shares IF I owned them (I don't) but not enough to get my interest peaked. 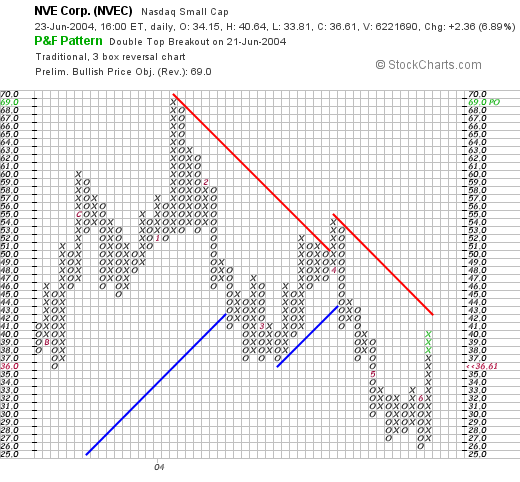 I posted Macrovision (MVSN) on this blog on 6/18/03 at a price of $21.15. MVSN closed on 6/25/04 at $24.99 for a gain of $3.34 or 15.8%. On May 3, 2004, MVSN announced 1st quarter 2004 results. Revenue jumped 35% to $38.0 million from $28.1 million in the same quarter last year. Net income was $10.8 million or 55% higher than the $6.9 million the prior year. This worked out to $.21/diluted share up 50% from the $.14/share reported last year. These results were great and the stock moved up accordingly. On April 27, 2004, LIFC reported 1st quarter 2004 results. For the quarter ended March 31, 2004, total revenues came in at $13.8 million, compared to $9.0 million the prior year. Net income was $883,000 or $.03/diluted share vs $218,000 or $.01/diluted share last year. These are very nice results! Tofutti Brands (TOF) was posted on Stock Picks on 6/18/03 at a price of $2.82. TOF closed on 6/25/04 at a price of $3.05 for a gain of $.23/share or 8.2%. On May 11, 2004, TOF announced 1st quarter results. Net sales decreased 12% to $4.0 million for the 13 weeks ended March 29, 2003. Operating income decreased to $99,000 from $458,000 the prior year. Net income decreased to $54,000 or $.01/share compared to $269,000 or $.05/share the prior year. These results give me pause. This is NOT what I am looking for in a company. On June 20, 2003, I posted Laboratory Corp. of America (LH) on Stock Picks at $30.68. LH closed on 6/25/04 at a price of $40.60 for a gain of $9.92 or 32.3%. On April 22, 2004, LH reported 1st quarter 2004 results. Revenues for the quarter were $752.5 million, an increase of 5.7%. Earnings/diluted share increased 19.6% to $.61/share vs. $.51/diluted share the prior year. These are nice results although I would prefer to see a more dynamic revenue growth number. Forest Laboratories (FRX) was postedon Stock Picks on 6/20/03 to finish off a busy week! They were picked at a price of $54.99. FRX closed at $58.46 on 6/25/04 for a gain of $3.47 or 6.3%. On April 20, 2004, FRX reported 4th quarter 2004 results. For the quarter ended March 31, 2004, net sales increased 17% to $725.1 million from $621.1 million last year. Net income however DECREASED 20% to $145.5 million. Diluted earnings per share came in at $.38/share vs $.48/share the last year. I like the increased revenue but the decrease in earnings DOES concern me. So how did Stock Picks do for the week of 6/16/03 last year? Of the 11 stocks picked that week there was only one losing selection, DHOM which was down (2.6)% from the selection price. The other 10 had gains ranging from 6.1% to 91.1% for an average of the 11 selections of a gain of 24.3%. Not too shabby in my humble opinion! Thanks so much for stopping by! If you have any questions or comments, please feel free to email me at bobsadviceforstocks@lycos.com . Hello Friends! That nickel in my pocket, which as you know comes from having sold a portion of a stock at a GAIN, was just BURNING a hole. What can I say? No self control I know. I don't deny it. ANYHOW, looking through the lists of top % gainers, I saw one of my favorites near the top, Lifeway (LWAY) a small company that makes KEFIR drinks....I think that is some sort of a yogurt drink. They have great numbers....LWAY is currently trading at $12.72, up $2.42 or 23.50% on the day (wow! )....and I purchased 200 shares at $12.72....guess that was MY trade lol...stock is a 60% margin requirement...so didn't want to PUSH toooo hard. Anyhow, that's the news. Remember I am an amateur investor...so please do your own homework on ALL stocks discussed on this website and consult with your investment advisors! Hello Friends! I am not REALLY convinced over the health of the bull market right now. So with that last purchase I was pushing my margin balance a little....and I WAS a little close to another sell point on Sanderson Farms (SAFM). So a few moments ago, I sold ANOTHER 1/4 position in SAFM. Our goal on a second sale is about a 60% gain. (I had already sold a 1/4 position last month!). To make a long story short, I sold 45 shares of my 180 share position, leaving 135 shares remaining, at $54.89. These 180 shares HAD been purchased on 2/3/04....just about 4 months ago (!) at $35.86. Thus I had a gain of $19.33/share or 53.9%. Pretty close to the 60% mark anyhow. Our next sell point will either be at about the 90% point on the rise...or back around a 30% gain....with our new strategy of allowing a stock to correct only to 50% of the sell point...if you follow me. P.S. With this sale, you know what THAT means...yikes...I have ANOTHER nickel in my pocket...but will TRY to sit on my hands today...you know UNLESS I see something fabulous (lol), before making another purchase. Read above about MARGIN! Hello Friends! Well that 'nickel' was sitting in my pocket all of 60 seconds. Seeing that NVE Corp...see the earlier post yesterday...was moving up AGAIN....well what COULD I do???? Well, I purchased 160 shares of NVEC at $39.39 a few moments ago....so will be watching this NANO stock closely now! A little speculative as 60% margin was required. Hello Friends! Well I got a little antsy with my American Medical Devices and sold 50 shares, 1/4 of my position, leaving 150 shares in my trading account at $32.24. For the first sale, I usually have a goal of about 30%. AMMD was purchased on 1/9/04 at a cost of $25.82/share, so I had a gain of $6.42 or 24.9%. This means my next price goal on these shares will be in the region of a 60% gain...when I should be selling another 1/4...or on the downside....if AMMD pulls back to around $25.82...then ideally it should be sold before it hits a loss. Do you follow? In addition, having now sold another portion at a gain this "entitles" me to make a new purchase....adding to the 22 position portfolio as I head towards my goal of 25. Thanks so much for stopping by! If you have any questions, comments, or words of encouragement, please feel free to email me at bobsadviceforstocks@lycos.com. Remember, I am an AMATEUR investor so please consult with your PROFESSIONAL investment advisors prior to taking any action based on information obtained from this website! Hello Friends! I meant to post this one earlier today when the stock was a bit higher...unfortunately it closed off its highs...so was NOT on the list of highest % gainers at the close...but since it was on the list for awhile and I WAS going to post...well it just goes to show that I should finish that job! Please remember as always that I am an amateur investor so please do your own investigation of stocks discussed on this website and consult with your own professional investment advisors before making any decision based on what is here! I do not own any shares nor do I own any options or leveraged positions on this stock. COHT closed today at $10.06, up $.09 or 0.90% on the day. According to the Yahoo Profile, Cohesant Technologies "...is engaged in the design, development, manufacture and sale of specialized two component dispense equipment systems and replacement parts used in the operation of this equipment and specialty two component epoxy coating and grout products." Apparently this equipment is used in construction, transportation and marine industries. On June 16, 2004, COHT announced 2nd quarter 2004 results. For the quarter ended May 31, 2004, net sales "increased 23.5% to $5,290,141 from $4,284,650 for the same quarter last year." Net income came in at $529,153, a 56.4% increase over the $338,391 reported the prior year. On a fully diluted basis this worked out to $.20/share compared to $.13/share the prior year. How about longer-term? Looking at the "5-Yr Restated" financials on Morningstar.com shows a steady rise in revenue from $11.7 million in 1998 to $16.8 million in the trailing twelve months. Earnings per share have increased each and every year from $.26/share in 1998 to $.52/share in the TTM. Free cash flow looks nice too! They were at $0 in 2000, increased to $1 million in 2001 and 2002, and then to $2 million in the TTM. Their balance sheet also looks nice with $2.8 million in cash enough to cover the current liabilities of $2.1 million. They, according to Morningstar, do not have any long-term liabilities. In addition, COHT has $7.5 million in other current assets. Cohesant Technologies sells products through its two subsidiaries: Glas-Craft and Raven Lining Systems. It was interesting to read the story of June 10, 2004 in which COHT announced the INITIATION of a cash dividend of $.13/share to be paid semi-annually. This is just ANOTHER plus for this stock. What about 'valuation'? Taking a look at "Key Statistics" on Yahoo, we can see that this is a TINY company....more nano than NVEC lol....with a market cap of $26.40 million. The trailing p/e is reasonable at 16.04 and the price/sales is nice at 1.41. No PEG is recorded due to the fact that probably no five year estimates are out there. Cohesant has only 2.62 million shares outstanding with only 900,000 of them that float. I mean TINY! There are 1,000 shares out short as of 5/10/04 representing 0.11% of the float or 0.2 trading days so this doesn't look significant to me. Interestingly, with the declared dividend, this company now yields 2.73%, not too shabby, and NO stock dividends are reported on Yahoo. Looking at a basic Yahoo line graph, we can see that this stock has been "behaving" nicely, moving higher in a steplike fashion, from $4 a year ago, to $7 in November, 2003, and now to the $10 level. I don't have a point and figure chart, but this looks nice to me. What do I think? Well this is a TINY company, so an investment in this stock could be volatile. However, the numbers look nice, the recent earnings report is impressive, the free cash flow is pretty, the new dividend is attractive, technicals look fine and the valuation is downright reasonable. I guess I like this stock lol. And technically, I CAN buy another stock with my portion sale at a gain....but will try to SIT on my hands lol...and let the market demonstrate a little more strength before stretching into another position. At least for the next 5 minutes! Thanks again for stopping by! If you have any questions, comments, or words of encouragement, PLEASE drop me a line at bobsadviceforstocks@lycos.com I LOVE to hear from any readers....just nice to know you are out there! Hello Friends! The market started out sloppy and grew stronger into the close. I don't know the significance of that but it sounds optimistic to me! Anyhow, if this is your first time on the blog, welcome to my world! If you are a returning visitor, well THANKS for coming back...and be sure to return often. As you probably know, I am an AMATEUR investor, so PLEASE do your own investigation of all stocks discussed on this blog and PLEASE discuss all ideas with your own PROFESSIONAL financial advisors! Well I was scanning the lists of % gainers today, and I came across NVE Corporation (NVEC)...which I could almost have sworn I had listed here once already....you know I am NOT sure how many stocks I have reviewed on this blog...but it is a load of 'em! NVEC had a nice day today, closing at $36.61, up $2.36 or 6.89%. It had traded as high as $40.64 during the day...so it actually traded off its highs into the close. According to the Yahoo profile, NVEC "...develops and sells devices using spintronics, a nonotechnology the Company helped pioneer, which utilizes electron spin rather than electron charge to acquire, store and transmit information." Yahoo goes on to point out that "NVE is a licensor of spintronic magnetic random access memory technology (MRAM)." Pertinently, NVEC announced yesterday that the U.S. Patent and Trademark Office issued the company a patent "for an innovative type of MRAM." According to the news report, "The invention therefore has the potential to significantly reduce MRAM write currents...." and "...could enable MRAM cell densities comparable to those of DRAM or Flash." PLEASE do not ask me to explain the difference between MRAM and DRAM....heck I can barely PRONOUNCE those words...but this memory thing was something the 'street' liked and the stock has reacted positively. Looking for the latest quarterly report, I found that NVEC reported 4th quarter 2004 results on April 28, 2004. Revenue for the fourth quarter ended March 31, 2004, came in at $3.21 million, an increase of 23% over last year's $2.6 million in the same quarter. Net income came in at $789,670 or $.16/diluted share compared with last year's $160,164 or $.04/diluted share. Looking longer-term at the "5-Yr Restated" financials on Morningstar.com, we see that revenue growth has been a bit erratic, increasing from $5.5 million in 1999 to $11.4 million in the trailing twelve months. Earnings have been all over the place but dropped to a loss of $(.60)/share in 2002, and have increased steadily since then with $.33/share reported in the TTM (trailing twelve months). Free cash flow which was $0 in 2001 $(1) million in 2002, $0 in 2003, turned back positive to $1 million in TTM. The balance sheet looks just fine with $6.7 million in cash and $2.5 million in other current assets as compared to $1.6 million in current liabilities and only $.1 million in long-term liabilities per Morningstar. What about 'valuation'? Looking at "Key Statistics" on Yahoo we can see that this really IS a NANO company with a market cap of just $164.53 million. The trailing p/e is at 82.64...and Yahoo has a forward p/e of 0...so I am not sure what THAT means....there is no PEG...when we get to tiny companies, there just aren't enough analysts that follow them...needless to say, with the rapid growth, the PEG can't be as bad as the P/E! Yahoo reports only 4.49 million shares outstanding with 2.10 million of them that float. I personally do NOT own any shares of this issue...there are apparently 1.60 million shares out short as of 5/10/04...representing 76.14% of the float (! )....but the volume of shares traded is only 2.178 days....so I guess the trading volume is rather good for a stock of such limited float (?). No cash dividend is paid...and in November, 2002, this company actually did a REVERSE 1:5 split. This company actually peaked out at about $69/share in January, 2004, and has traded lower fairly steadily since then. Recently, with the current rise especially, it is challenging a resistance level at about $41. Would like to see it break through that area...to suggest it had reversed the downward spiral. Certainly, the stock is not at this time ahead of itself or technically extended like a lot of stocks we examine. What do I think? This is a fascinating stock and if you like the idea of a NANO company....well then this might be the ticket. The recent revenue and earnings growth looks nice, the free cash flow and balance sheet looks terrific....but I cannot tell much about valuation...and I am a little concerned about the technicals. Besides, I personally DO NOT HAVE ANY MONEY lol. A Reader Writes "Have you heard of any free, thorough stock screener sites?" options like free cash flow included? That is a GREAT question, and quite frankly, I am not sure if I am the one to ask! However, I recently came across a wonderful list of financial links on thegoldencoast.com which I noted DOES have some free cash flow screeners....so good luck. If you have other questions, or if other readers have questions, please feel free to email me at bobsadviceforstocks@lycos.com and I will try to give you the best answer I can! Remember, I am an AMATEUR investor...so always do your own homework on ideas and stocks on this website! Hello Friends! I am sure glad you took the time to stop by and read the blog. Please remember that I am an AMATEUR investor so please do your own investigation of all investments discussed on this website, and please consult with your PROFESSIONAL investment advisors! I hope all of you had a Happy Father's Day! My daughter took me out to see "The Terminal" with Tom Hanks...and that would be my MOVIE pick! (Is this an idea for a new blog or what?) Cute flick. I came across Amedisys (AMED) today scanning through the lists of the greatest percentage gainers. AMED closed at $30.74 today, up $2.35 or 8.28%. According to the Yahoo profile, AMED "...is a multi-state provider of home healthcare nursing services." On May 4, 2004, AMED reported 1st quarter 2004 results. Net service revenue grew from $31.1 million in 2003 to $47.3 million in 2004. Net income grew from $1.1 million or $.12/diluted share in 2003 to $4.2 million or $.34/diluted share in 2004. If we look longer-term at the "5-Yr Restated" financials on Morningstar.com, we can see that except for a dip from 1999 to 2000, revenue has grown from $97.4 million in 1999 to $142.5 million in 2003. Earnings per share have grown during this period from $.42/share to $.83/share in 2003. Free cash flow has improved from $(12) million in 2001 to $20 million in 2003. The balance sheet is quite good with $29.8 million in cash and $19.8 million in other current assets balanced against $34 million in current liabilities and only $7.1 million in long-term liabilities. If we check "Key Statistics" on Yahoo, we can see that this is a small cap stock with a market cap of $378.29 million. The trailing p/e isn't bad at 29.70, the forward p/e (fye-Dec-05) is nicer at 19.21. The PEG is reasonable (imho) at 1.21. There are 12.31 million shares outstanding and only 8.00 million of them that float. Of these, there were 869,000 shares out short as of 5/10/04 representing 10.86% of the float but only 1.814 trading days of volume. 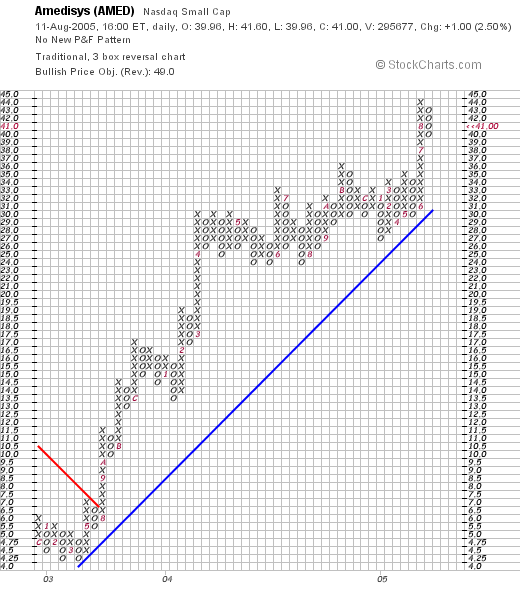 The "Point and Figure" chart from Stockcharts.com shows a stock consolidating across 2001 and into 2003 in the $3.50 to $12.00 range. In August, 2003, AMED broke through a resistance level at about $6.00 and headed higher almost uninterrupted to the current level around $30. The graph looks strong to me.